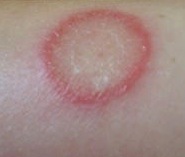 The most common symptoms of ringworm are raised, red bumps that may form in a circle around a clear center. This “ring” is the source of the condition's name, though not all cases of ringworm produce a ring. Ringworm infections may appear to look like large pimples on the skin. Skin may appear red and flaky and be extremely itchy. If the condition affects the scalp, patches of hair may fall out or break off. Ringworm (tinea corporis) is a fungal infection. The fungi live superficially on dead tissues found on the skin, nails, and hair. Though the name alludes to the condition being caused by a “worm”, there is no worm associated with ringworm. Ringworm can infect the feet and genital area, causing athlete's foot and jock itch. The condition is extremely easy to treat. Ringworm is easily passed from one person to another. It is important to protect your skin at all times, especially when using public areas like showers, locker rooms, and pools. Wash athletic clothing often and never use an athletic pad before disinfecting it between uses. Pets can also carry ringworm, so wash hands after touching or petting pets to prevent infection. Though the name alludes to the condition being caused by a “worm”, there is no worm associated with ringworm. Young athletes are highly susceptible to ringworm infection, especially when using public bathrooms and athlete mats. It is important to wear foot protection at all times and never share equipment that touches the skin. Many young athletes find it difficult to prevent infection due to the extensive amount of equipment used in youth sports. You should not expect to have any pregnancy complications if ringworm is diagnosed and treated properly. Ringworm is easy to diagnose visually, but doctors may take a small skin sample for testing in some cases. Antifungal medications usually clear up the infection within a few days, but more severe infections may require a more lengthy antifungal treatment.